the role of water and characterize the broad spectrum of surface radiation. Habitability is the concept of a habitat, and the term ‘habitat’ refers to an environment that is or was occupied by life. Local atmospheric conditions (pressure, temperature, humidity, wind) will help to understand Mars surface and shallow surface environments and evaluate it as potential life habitat. Local and global conditions has a strong relation (boundary layer oscillations, dust devils, microfronts, local dust storms, slope winds, mountain-lee waves,… ) between them; global circulation and mesoscale models are the tools used to understand those links. REMS will contribute to validate those models and augment new variables to what has been learned from previous Mars missions. As it has said above, models are the tool used to study local environment based on global phenomena, which means that with the information provided by REMS and its contribution to model validation will be possible to search for habitat elsewhere on the planet, not only in the landing site. The instrument has four main components: Boom 1, Boom 2, UV sensor and the ICU box which includes the pressure sensor. 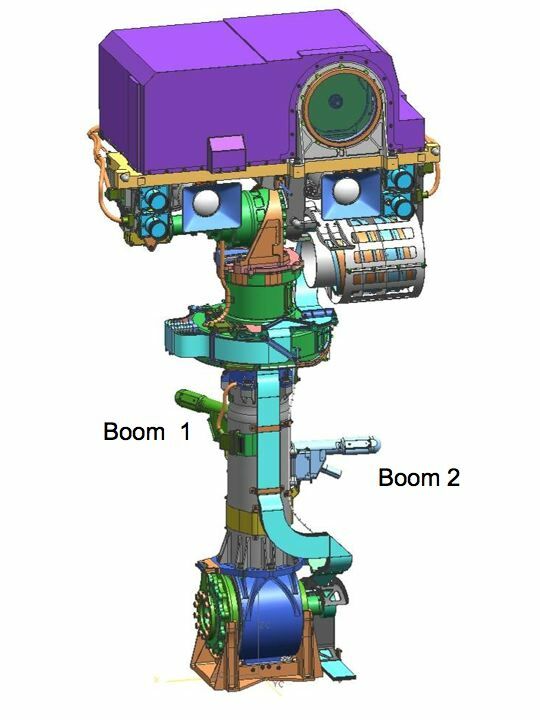 Both booms are located at the Rover Mast, the UV is placed over the rover deck and the ICU inside the rover body with an opening into the Martian atmosphere for pressure sensing. All sensors will collect data, autonomously, at 1 Hz sampling rate in blocks of continuous 5 minute periods every Martian hour throughout a sol. All stored data will be transmitted to the Ground Station for post-processing. These data blocks add up to an equivalent of 2 continuous hours/sol recording. An additional hour will be used to record phenomena which occur during foreseeable periods where relevant atmospheric events are expected, such as during sunrise or sunset, and also occasionally to track an unpredictable event. Of the four missions that have come to the surface of Mars, three of them had instruments to measure environmental conditions on its surface. 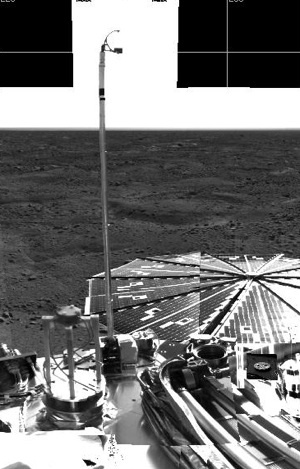 Image taken by the lander’s camera where you can see the pole on which the meteorological sensors placed ivan probe Viking. ments was a group of sensors to measure pressure, air temperature and wind speed and direction. In the picture you can see one of the three temperature sensors were installed on the mast of ASI / MET. Twenty years after the Viking, in 1996 the Pathfinder mission came to the surface of Mars. It was the experiment ASI/MET, with which it was to measure temperature, pressure and wind speed. All these sensors were placed in a small mast 1.1 m high, located on the lander. In this picture you can see the mast on which are installed temperature sensors. At the top, the device is designed to estimate the wind direction. of Mars have been Phoenix, in 2007. The lander carried out his mission on northern polar Martian region and available temperature and pressure sensors, and a LIDAR to study the contents of aerosols (mainly dust and ice).